Last weekend I bravely embarked on an adventure with Oscar and Cooper that I’ve been wanting to do for a long time – a canoe trip. It’s something I was pretty sure the dogs would enjoy, but I’d been putting it off for a long time because frankly, I didn’t know exactly “how” to do it. I was nervous I wasn’t prepared for taking the dogs on such a journey, and I was worried because I had no idea how they would handle it. 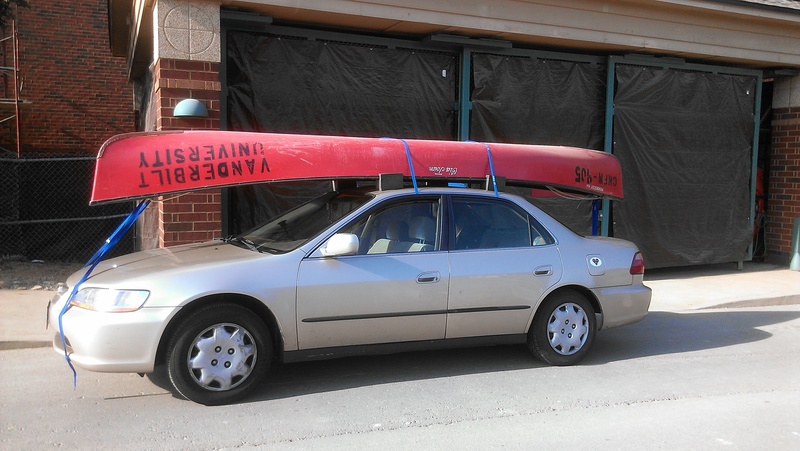 However, on this particular weekend, my adventurous spirit got the better of me and I thought, “I’m just going to do it.” So I rented a canoe, strapped it to the ol’ Honda, and off we went. Foster dad was otherwise engaged so I grabbed two of my girlfriends, one of whom is a total outdoor nut and is on the river often, so I at least had her to rely on as the expert of the canoe part of the trip. The dog part would be up to me. I resigned myself to the fact that the first 45 minutes or so of the trip would probably be pretty horrible, until the boys and I got our rhythm down. I was right. The first 45 minutes totally sucked. Oscar almost drowned. Well maybe not actually nearly drowned, but he sure freaked me out. The canoe probably freaked him a bit at first, because one of the first things he did as we pushed off was jump right out in the middle of the river. Now, Oscar has been swimming plenty of times, and is very at home in the water. But, at this particular point in our journey, there was nowhere in sight easy to pull off to the shore and hoist him back into the canoe. So, poor Oscar had no choice but to swim along side the canoe until we could find somewhere to pull over. It was definitely the farthest he’d ever swam, and I thanked my good sense that I had put him in a life jacket with a handle on the top. Picture me carrying an Oscar suitcase over the side of the canoe as he paddled along. He did not jump out again. We nearly lost Cooper over the side as he tried to eat the splashing water. Cooper has a thing for splashing water, remember? However I think he learned from Oscar because we managed to keep him in the boat. We nearly lost both the boys on a stop, after they swam to the other side of the river and scrambled up a steep bank. This was easily the scariest moment of the day. After Oscar abandoned ship and we nearly lost Cooper over the side as well, we decided we needed to pull off and regroup. We found a nice little pebbly area and pulled the boats up onto the rocks. It looked like a great secluded spot where there was “nowhere for the dogs to disappear off to,” and they could splash around and release some energy. Well that was a foolish thought. Almost immediately both Oscar and Cooper bounded into the water, swam to the opposite side of the river and climbed out onto some slippery rocks. 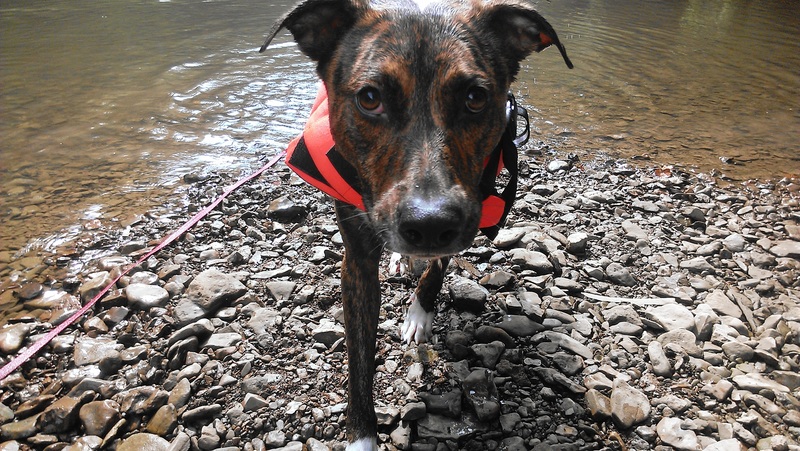 Too nervous to jump back into the water off of said slippery rocks, Oscar just froze and Cooper scrambled up the steepest river bank I had ever seen – I would have thought there was no way he could have gotten up there, but he proved me wrong! Thankfully he was responsive to my calls and came back down (who knows what was at the top?? 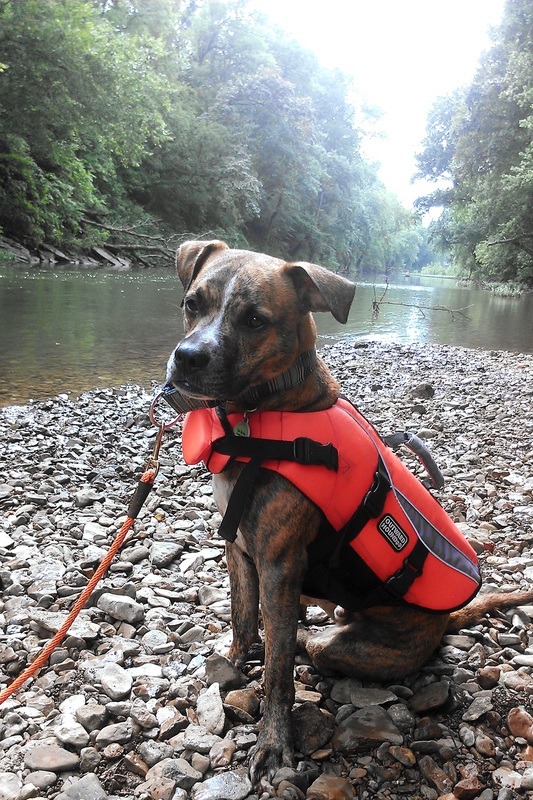 ), but he still didn’t want to swim back across the river. So, I did what any momma would do, and went to the rescue of my boys in need. I waded across to collect them. Once I got out into the river I realized it was traveling faster than I thought, so even if the boys had jumped in to swim back across, they would have ended up way down stream. Thankfully the water only came up to my waist so I was able to keep two feet on the river bottom, and coaxed Oscar and Cooper off of the rocks into the water. I held onto their life jacket handles as they swam along beside me back safely to shore, where they stayed safely clipped to their long leashes for the rest of the trip. Cooper peed in the boat. Yep, nothing else really to say about that. So what did I learn? Lots. 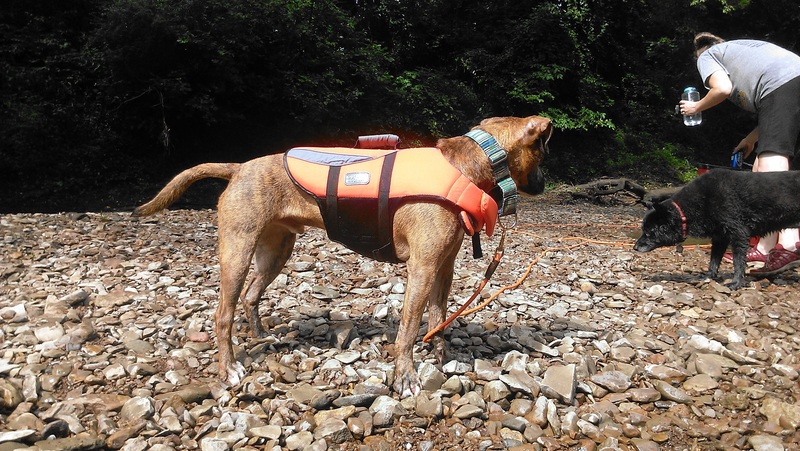 First of all, no matter how good of swimmers I think they are, life jackets are super important for the dogs. No, not important – necessary. Oscar and Cooper are both great swimmers, but I can’t shake the feeling that something horrible could have happened if they hadn’t been wearing them. Shoot, if for no other reason than ease of picking them up, they are the best money I’ve ever spent on dog stuff. 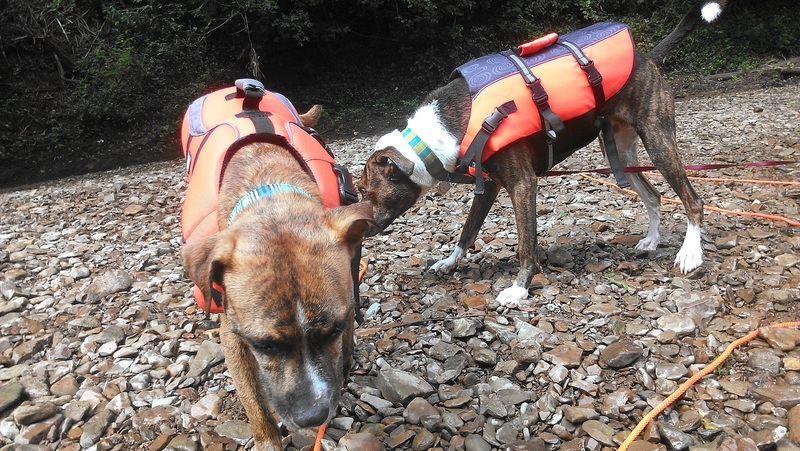 Both Oscar’s and Cooper’s vests were from Outward Hound, and they worked perfectly. Second, they boys have to stay leashed. As much fun as it is to let the dogs run around on their own and let them swim and play at will, the fact is that they don’t have enough off leash training for me to trust them to stay close, even in what I think might be a safe atmosphere. 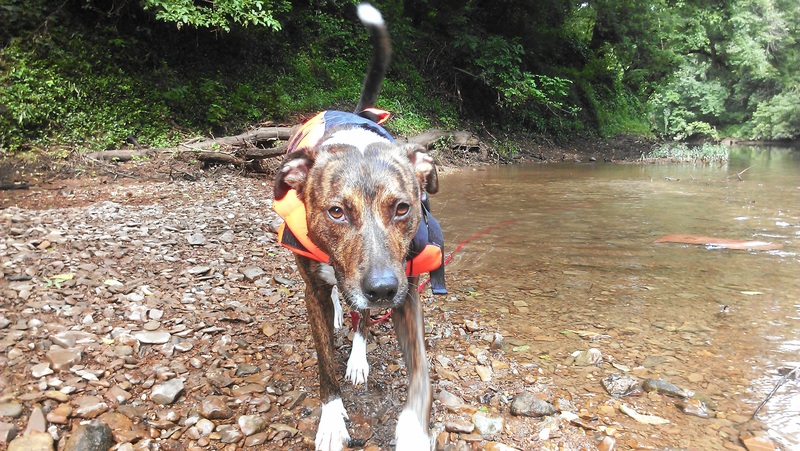 Even after we returned safely from the other side of the river, Oscar tried to swim over again. This time, since he was on a leash, I could gently spin him around and bring him back to our side. Third, seating arrangements: at first, I thought it would be better if my friend sat in front of the canoe, and for me to sit in the back so I could keep an eye on the boys. As it turns out, the person in back is pretty dang important to things like steering, and you know, going. I was so distracted by the dogs most the time that we ended up hitting trees, rocks, and even spinning completely around backwards. After our regroup, my friend and I switched positions and I sat in the front but faced backwards. That way, if I had to stop paddling to keep a dog from jumping out or something, it wouldn’t matter as much as if I had been in the back. The last thing I learned is that there’s always going to be a “first time” you do something new with your dogs. You can live in fear and worry and wait until you magically know that everything will go perfectly, or you could realize that some things are impossible to predict, prepare as best you can, and just jump in. I would absolutely take the boys canoeing again. Next time, it still won’t go perfectly, but it will go a little better. And a little better still the time after that. Hey, even by the end of this first trip, I had two dogs laying down in the canoe. And that’s pretty darn good. 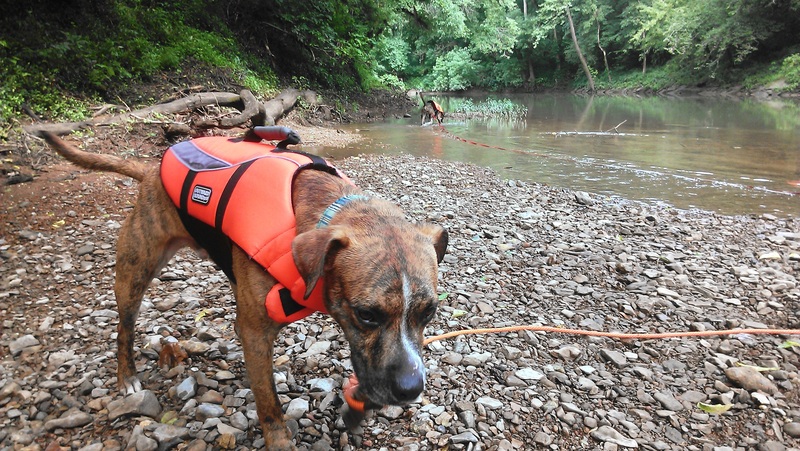 So, now I ask you guys…what kind of adventures to do you go on with your dogs, and how did your first time go? How did you prepare, practice and get better? Or, what’s something you’ve wanted to do with your dog, but have put off because you’re nervous about how it will go? Please share your canine adventurings below! Your Very Own Oscar-Cooper Hybrid! You guys….I’m sorry, I just couldn’t NOT share this guy with you. How ridiculously adorable is he? And is it any wonder why I had an “erhmegerd” gasp out loud moment when I saw his picture? He looks like the perfect mix of Oscar and Cooper! It’s no secret that I’m a sucker for the brindles, but Victor, oh Victor…you are a serious looker my friend. And he could be yours! 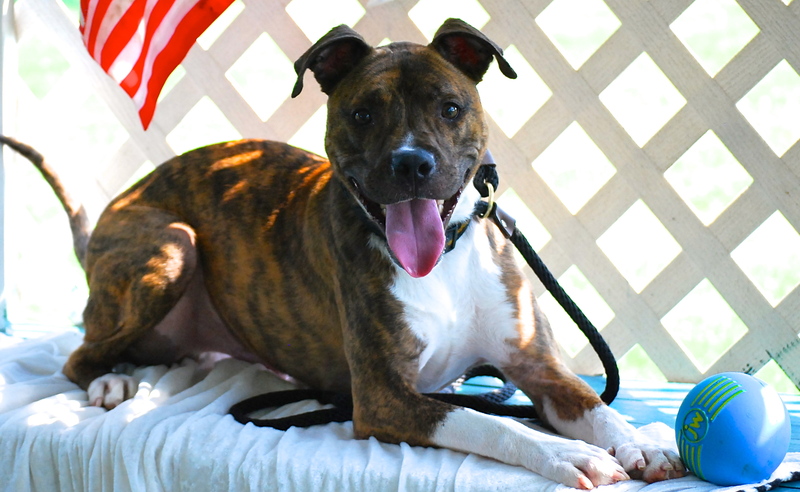 My name is Victor and I am a good-looking 4-year-old American Staffordshire Terrier/Boxer Mix. I am a current resident of Williamson County Animal Control but I need a forever home. I have a happy-go-lucky personality that has made me a favorite at the shelter. I am very popular with the volunteers that love me and always one of the first to be walked. I have been told I am the total package: handsome: check, friendly: check, lots of personality: check, fun to play with: check, a perfect gentleman on the leash: half check…come on I’m a dog and I love to sniff. I love my time in the play yard chasing tennis balls and the love and attention I get from the volunteers…did I mention I am very social? I am a smart boy and I listen well. That means I would be easy to train and quick to learn. As a matter of fact I am already housebroken and crate trained. I have a lot of love to share – I just need a family to share it with! I am ready to go home all I need is you! Sounds like the perfect package to me! 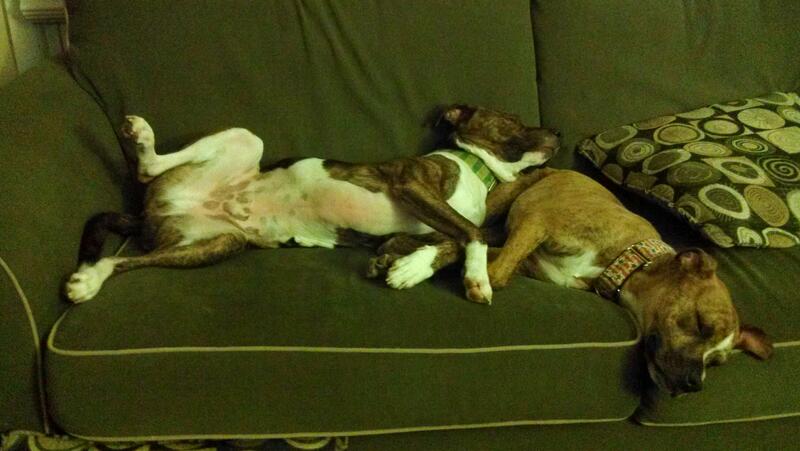 If someone (ahem, Cooper) wasn’t taking up the foster-spot at our place, well…you know who would be! If you’d like to meet Victor or learn more about him, or if you know someone who wants their very own Coop-Oscar-ganger, they can contact WCAC at 615-790-5590, or e-mail animal@williamson-tn.org.